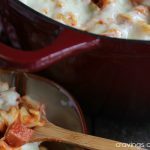 Smoked Bacon Macaroni and Cheese is a delicious 4 cheese macaroni and cheese dish filled with smoked bacon. This dish was inspired by Patti LaBelle’s Over the Rainbow Mac n Cheese. Seriously delicious mac n cheese that is loaded with cheese, cheese and more cheese. Plus some bacon for good measure! Thanks for stopping by today. I have a delicious dinner recipe for you. Nothing beats a great mac and cheese recipe for dinner. Kids and adults love macaroni and cheese. I’m a serious sucker for all things BACON! I cannot get enough of it. I keep packs of it in my freezer at all times. If you love bacon this recipe is perfect for you! 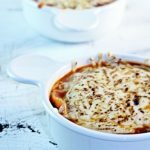 I also happen to be crazy about cheesy recipes! 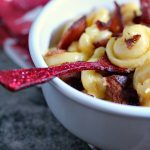 If you love melty cheese recipes this smoked bacon mac and cheese recipe is absolutely perfect for YOU! This dish was inspired by Patti Labelle’s Over the Rainbow Mac n Cheese. If you have not tried hers yet you are really missing out. It’s beyond decadent, it’s filled with 10 kinds of cheese. She does a version with lobster too which makes me wish I wasn’t allergic. I made a couple of small changes, more due to geography than anything else. Some cheeses can be hard to find here. Plus my daughter, mini-me, is picky about cheese. The apple does not fall far from the tree since I am too. I had a blast making my mac n cheese. I don’t make it very often so I got a little carried away and made three versions to try out. I’m cool like that. Needless to say, our freezer is well stocked with pasta right now. The perks of getting carried away. Mac and cheese freezes perfectly. Just add extra butter when reheating it! Another tip for reheating macaroni and cheese is to do it in the oven. I hate microwaving leftover mac and cheese. It tastes better when it’s reheated in the oven, in my humble opinion. Hope you love this version. It’s my favourite. What can I say, I’m a bacon lover!! 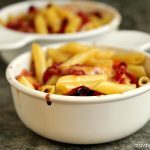 Smoked Bacon Macaroni and Cheese is a delicious 4 cheese macaroni and cheese dish filled with smoked bacon. This dish was inspired by Patti LaBelle's Over the Rainbow Mac n Cheese. Seriously delicious mac n cheese that is loaded with cheese, cheese and more cheese. Plus some bacon for good measure! Cook bacon in a large skillet over medium heat until crisp. Remove from skillet and place on a plate lined with paper towels to help drain off any excess fat. Pat bacon dry. Cut into pieces. Set aside. 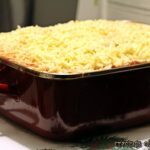 Preheat your oven to 350 degrees F. Spray a casserole dish with non-stick spray. Set aside. Bring a large pot of water to a boil over high heat, once it's at a rolling boil add a generous amount of salt. Toss in the noodles, and cook until tender, about 1 minute less than the package instructs. Don't overcook the pasta, you don't want it to be mushy. Remove from heat, drain the pasta and set aside. In a medium sized saucepan, melt eight tablespoons of butter. Stir in the cooked noodles. Then toss in all the cheeses, but reserve 1 cup of sharp cheddar. Add the half-and-half, and the eggs to the pot and mix well. Sprinkle with salt and white pepper. Transfer the mixture to the casserole dish that you had set aside earlier. Toss the rest of the cheese over top and add the remaining butter as well. Place in the oven and bake it until it starts to bubble up, and you can barely contain yourself from eating it right out of the oven. This should take about 30 to 35 minutes. Remove from oven. Sprinkle the chopped bacon over top. Mac n Cheese Mania was hosted by Rachel Cooks and Nutmeg Nanny. Mac and Cheese Mania was sponsored by Door to Door Organics and OXO. I was not compensated in ANY way for participating. Nor did I receive any products. 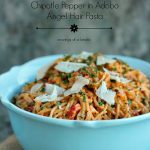 If you’re looking for more dinner recipes be sure to check out my recipe index. You can also find a lot more pasta recipes as well. Those photos are making me SO hungry! Thanks Maureen, I loved this mac n cheese. So good. Butter, cheese, half-n-half, and bacon. You just can’t go wrong with that combo. Ever. Love! Kimmy, this looks so delicious. I’d love a bowl right now for breakfast. If it’s a wrong I broke the rules a lot this week. Thanks lady. That glitter spoon is one of my favourites. So cute. This recipe looks delicious! I’ve never made mac and cheese. We never had it growing up, so I never looked for it. Can’t wait to try it. Pinned. This looks rich and creamy. Thanks for sharing. Yum yum yum! Bacon! Also, I love that sparkly red spoon… perfect for the Over the Rainbow correlation. Thanks Sarah, that spoon is one of my favourite props. 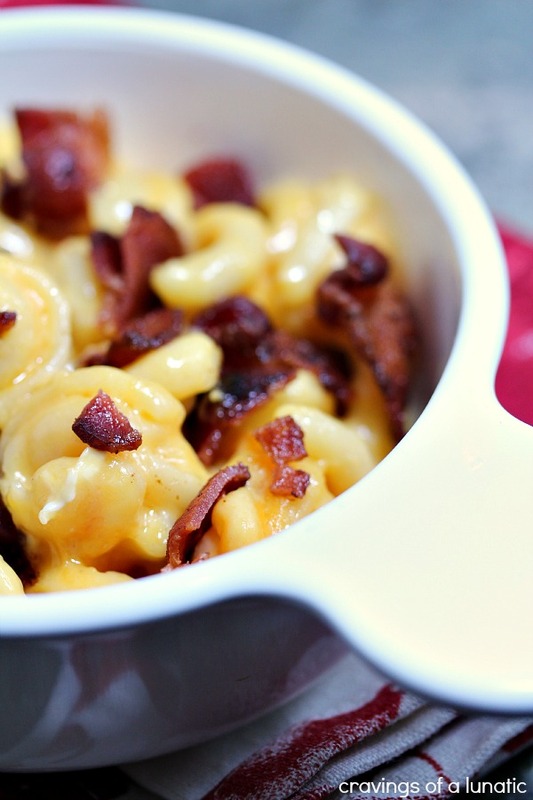 Bacon just belongs in mac ‘n cheese! Makes an already good dish so much better. Yours looks terrific — thanks. Thanks so much John. I’m such a bacon girl. Any excuse to use it I’m going to take it. OH. MY. GOSH! soooo much cheesy goodness! and bacon? uhhh ahmazzzing! Thanks Kayle. I have a weak spot for bacon…and cheese. OMG smoked bacon?! That is so good in mac and cheese. You totally have my attention. Again. It’s been so rainy here that some cheesy comfort food is really what I need. Thank you for making this for us! I love me some smoked bacon. It’s delish. Hope the weather clears for you. It’s cold here. Blech. Gorgeous creamy bowl of goodness! Anytime bacon is involved I am happy! Me too. I’m such a bacon freak. I always have to make double the amount because I’m stealing it out of the pan as I go. I pretty much prefer my bacon with my cheese. This mac looks fan-freaking-tastic. That spoon is too cute. Me too, it’s so good. Thanks Jennie. Ha, that spoon is a family fave. TEN DIFFERENT CHEESES?! Whoa. I’m not sure I could even list ten different cheeses! Yours looks crazy cheesy even though there aren’t quite SO many as all that! I know right, it”s wild. Patti knows her stuff. Thanks Joanne. I had fun doing this. You’re the first blog that is teasing me with Mac n cheese. You see, I’ve never made it myself… How weird is that? The reason is probably that my husband is not a big cheese fan so I’d have to eat it all myself, but seeing this… You have me drooling early in the morning!! Although the ten cheeses from the original sounds like a bit of overkill… 🙂 I’ll stick to your version! I never made my own till last year. I always hated the stuff, but I’d only ever had the box stuff. Making your own is a game changer. Easy and delish. Thanks so much Julie. I loved yours, very cool recipe. bacon make everything better! love it! Looks totally amazing!!! Thanks for helping us kick off our event! Whoa. This sounds incredible! Definitely saving this for later. I’m just about mac-and-cheesed out. 😉 Like you, I also made several versions! Thanks Erin. I had so much fun doing this event. I fixed all the links the first day so I’m not sure why they aren’t working for you. I just checked them again and they’re working for me. I spent a couple of hours fixing links the day we posted because so many weren’t working. Made for a long day. Do you have broken link checker Erin? Email me for deets if not. It’s an amazing plugin, it notifies you when links are dead. Works awesome. I only know because I had thousands of broken links from a photo incident with G+ (never delete albums if you were ever on blogger, even if you’re not now). So now I check them weekly. I run so many group things that I’ve gotten used to clicking through all the links. But it could have been a glitch. If a plugin went wonky or my site got weird it could make it do weird things. I know I had an issue the other day where some of the pin it buttons were interfering with images. It’s never ending. Anyone who says blogger is a hobby and not time consuming is on crack, I swear. It’s a full time job. I think all of mine are correct now so just copy mine. Or email me and I’ll send you my html. I appreciate the heads up though. How would we ever know there are issues if people don’t speak up. I never mind peeps popping by to tell me stuff. Twice now I’ve had promosimple knock my ads completely off my page. Once for half a day, a very busy day, but luckily a friends notified me so I could fix it as soon as I got home. That was freaking horrible. I think I missed 20K is ad impressions by the time I fixed it. I hate promosimple so very much. Um, WHAT are these spoons. I need them! I also need this mac and cheese in my face right now. Ugh! I should not be reading this while hungry. And at midnight!! 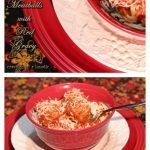 Kim, I just found this recipe today and it looks amazingly! I hate to be picky, but I want it to be just right when I make it. Except for the ingredient list, I don’t see any further mention of the bacon! I just wondered if you mixed it into the pasta and cheese and then baked e whole thing, or did you add it on top and bake, or just add it on top after it finished baking? 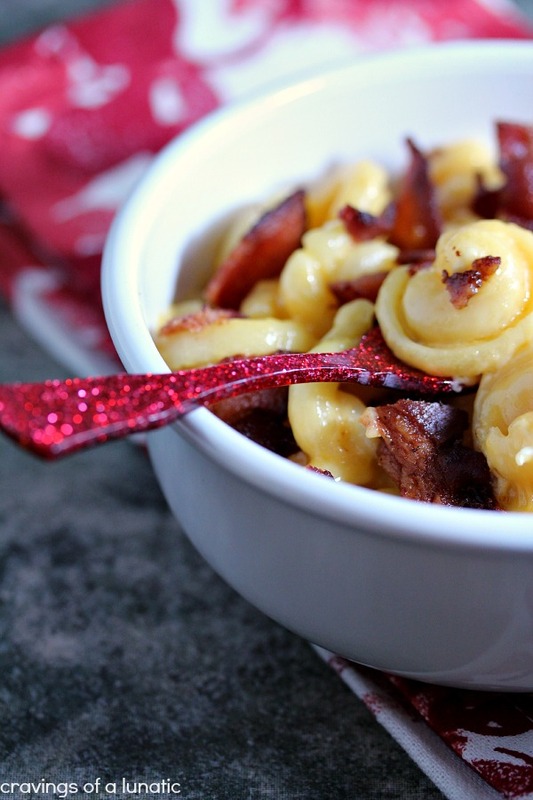 No matter what, bacon can only enrich Mac and cheese, but I want to get it right! Thanks for the recipe and the bacon info! Hey Cindy, I’ll pop in the post and check that immediately. Thanks for the heads up. The downside of working for yourself is not having an editor to proof read. Pop it in before you bake or after. I tend to add half before then save half for sprinkling over top with dishes like this. Ha, I don’t blame you. A lot of people feel that way. I hadn’t eaten Velveeta since I was a kid and my mom used to make us cheese & crackers with it, lol. But I figured what the hell, and went with it. If you can’t stomach using it I’d swap it for more cheddar. You could also give colby a try, I love it but it’s a bit hard to find in our town. Try giving it a kick with some Tex-Mex cheese, it’s a mix of Queso Quesadilla, Pizza Mozzarella, Cheddar, and Monterey Jack cheeses. I use that for making fundido and it melts beautifully. I have to admit I’m a sucker for Pizza Mozzarella. I tend to prefer white cheeses over all the orange ones out there. I don’t know why, maybe just a personal preference. Costco sells some fabulous pizza mozzarella. And their parmesan reggiano is to die for. I pop the rind in with my spaghetti sauce as it simmers and it gives it such a rich flavour. Really this would be special and great smoked bacon macaroni and cheese recipe, Kim! Absolutely love your recipe, thanks for sharing! Thanks so much Jill. I really appreciate it. That smoked bacon macaroni and cheese looks absolutely fantastic. Beautiful photos, too. I look forward to trying this. Hi Julia. Thanks so much. I hope you get a chance to try it. Have a great weekend.